Description: Prime 7.38-acre industrially zoned land parcel in the Fox Field Industrial Corridor, which is located just one parcel away from the intersection of Ave F. and 60th Street. This property is in the city limits of Lancaster, California. 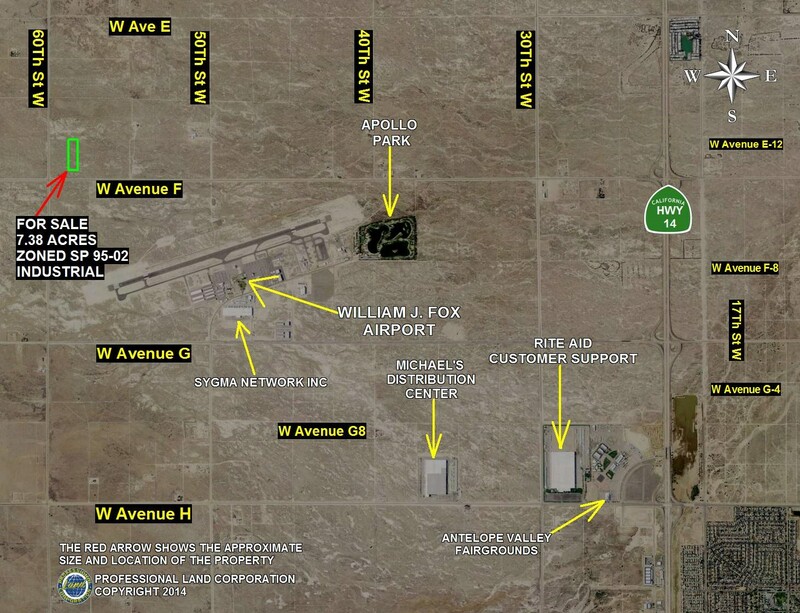 The Fox Field Industrial Corridor is an approximate 9,000 acre master planned industrial area that is currently home to a major distribution center for Rite Aid drug stores, Michael's Arts and Craft Supplies and SYGMA Foods with the new National Guard Armory and the new Antelope Valley Fairgrounds also located nearby. It is also home to the Fox Field Airport. In November 2013, the Los Angeles County Economic Development Corporation (LAEDC) recognized the City of Lancaster as the “Most Business-Friendly City” in Los Angeles County. The Eddy Award is the equivalent of an Oscars for the most pro-business city. With nearly $544 billion in annual output, Los Angeles County ranks among the world’s largest economies. Its GDP is larger than Switzerland, Sweden, even Saudi Arabia. The County’s population of nearly 10 million would make it the 9th largest state in the U.S. and Lancaster is the most pro-business city in the county! According to the Greater Antelope Valley Association of Realtors website, GAVAR, the entire Greater Antelope Valley area has a total population of 507,220. In 2012, the city of Lancaster had a total population of 157,826, and has consistently been ranked in the top 25 “Fastest Growing Cities in America.” This 7.38-acre land parcel is located in recorded Parcel Map 19621.
zoning: SP 95-02: This SP 95-02 zoning is in the Fox Field Industrial Corridor and this zoning permits office, research and development, light industrial, manufacturing, support commercial, public/institutional, fairgrounds, and golf courses, subject to the requirement and development approval of the city of Lancaster. Description: This property is located about 1 mile to the east of the 14 Freeway and about 1.25 miles to the north of California City Blvd., which is a freeway interchange off the 14 Freeway. The property is located between this Freeway and the Union Pacific Railway. This 41.06-acre property has about .75 miles of railroad track frontage on its eastern boundary. The property also has section line frontage. The zoning would permit a large number of single-family homes on one-acre lots. 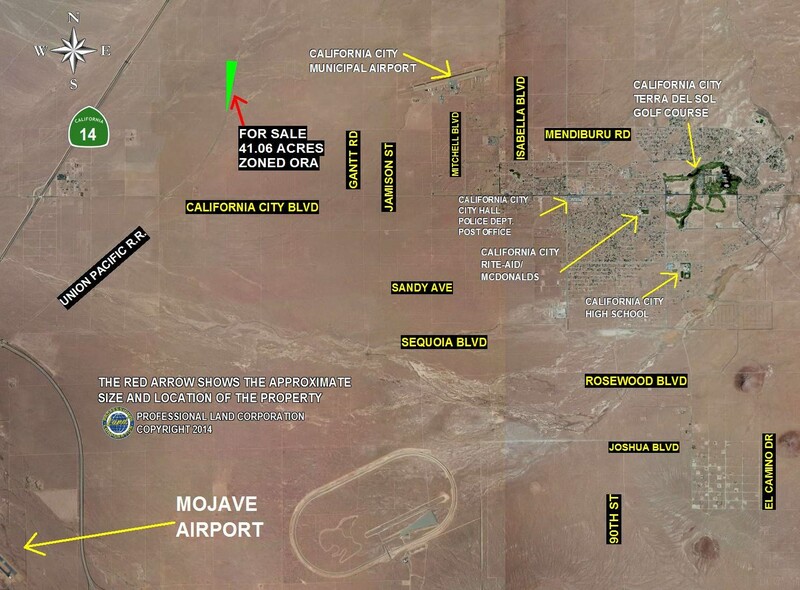 This land parcel is in the city limits of California City. 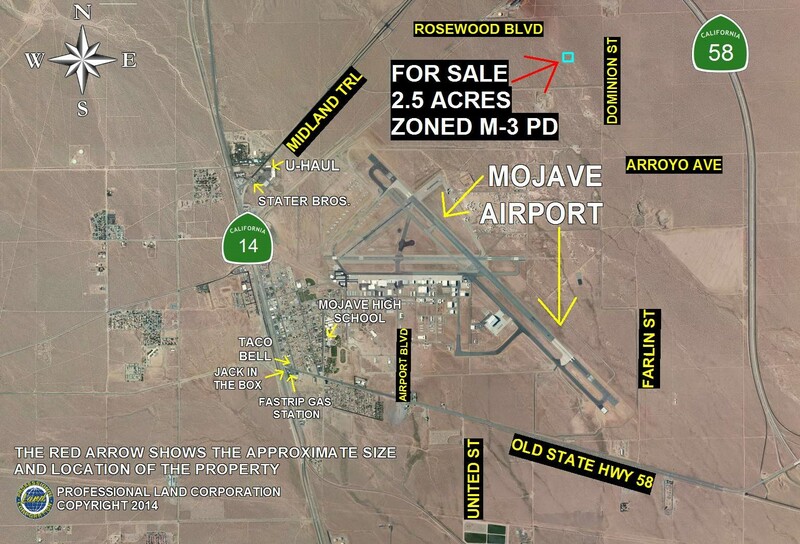 The Mojave Airport is located about 6 miles to the south of this 41.06-acre property. zoning: ORA: This zoning would permit the development of one-acre lots for single-family homes, subject to the requirements and development approval of the city of California City. Description: This property is located about .2-miles west of Dominion, situated about 1.2-miles northeast of the Mojave Airport, and is well located about .95- miles to the west of the new Mojave State Highway 58 Bypass. It also lies about 2.73-miles north of Old Hwy 58. It is also situated about 2.5- miles northeast of Hwy 14, and about 2.62-miles northeast of Mojave High School. It is also in close proximity to U-Haul, Stater Bros., Taco Bell, Jack in the Box and the Fast Trip Gas Station. The zoning on this 2.5-acre property would permit a large number of commercial, retail and industrial uses. zoning: M3-PD: This zoning would permit commercial uses, such as office buildings, banks, savings and loans, car dealerships, movie theaters, hotels, motels, grocery stores, restaurants, gas stations, car washes and other commercial uses. This zoning also would permit industrial uses, such as research and development, pharmaceuticals, lumber, industrial storage and other industrial uses. These uses would be subject to the requirements and specific project approval of the Kern County Planning Commission. Description: This prime 8.24-acre land parcel is situated on the west side of the 14 Freeway, and is located about 1.6 miles to the north of the Dawn Road Interchange and south of Sopp Road. It is located about 660 feet to the north of Highgate. This property offers tremendous visibility from the well-traveled 14 Freeway. The 14 Freeway is also known as the Antelope Valley Freeway and connects with the 5 Freeway, taking freeway travelers to the Antelope Valley from the San Fernando Valley and Los Angeles. 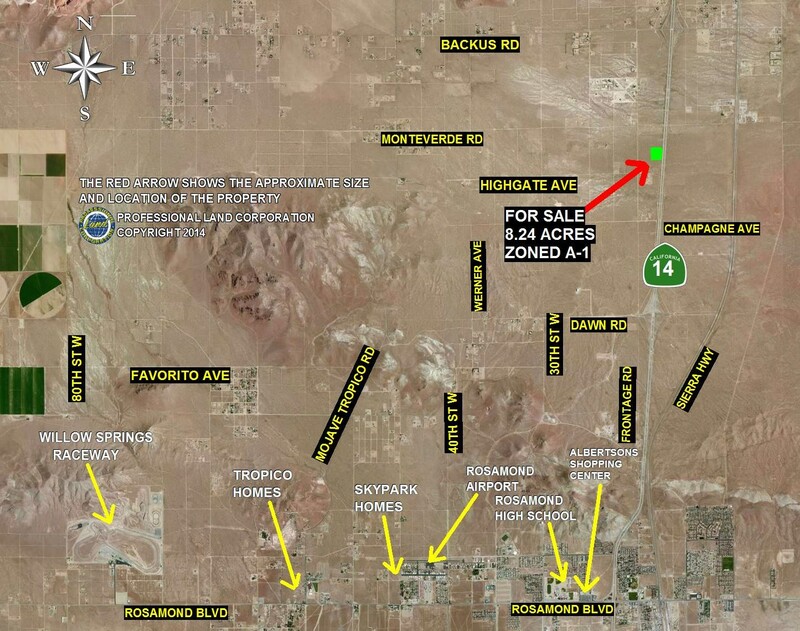 Dawn Road is located one interchange north of Rosamond Blvd off the 14 Freeway. zoning: A-1: This zoning would permit a wide array of uses, including the development of a single-family home, the growing of crops, and the raising of animals. It also would permit some institutional uses, such as, a public agency or a public utility building and facilities. These uses are subject to the requirements and development approval of the Kern County Planning Commission.